I’d like to take a few minutes of your time to introduce you to the newest addition to the Tief & Breit stable. As some of our readers will know, I was building a BMW E39 Touring which was supposed to be ready for this year’s season. However, when I discovered some heavy rust on the undercarriage while working on the suspension (I could stick my screwdriver into the trunk from under the car), I made the decision to abandon the project and start anew with a fresh, different canvas. My choice fell upon this Audi A8. I’ve never been a big Audi fan, but the A8 has always been one of the few that I felt attracted to. 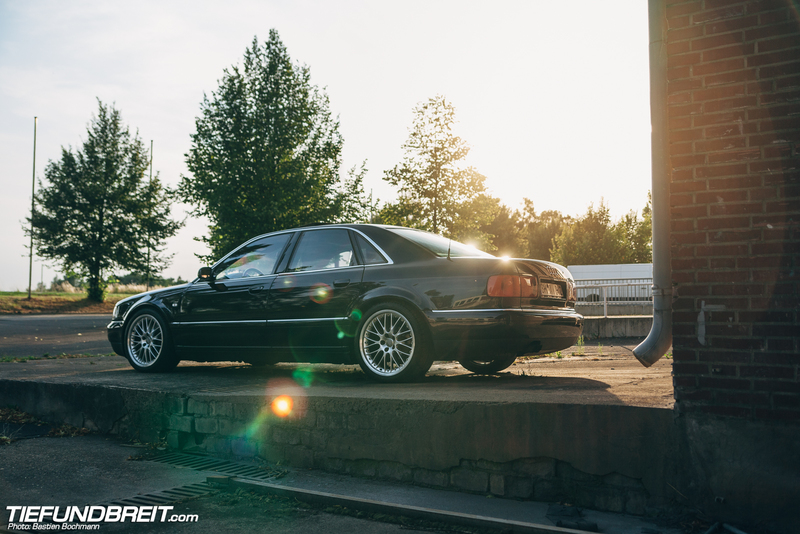 I was originally looking for a Mercedes S-Class W140, but when all the ones in my price range turned out to be complete wrecks, I started looking around for other big, comfy sedans. I test drove an A8 and liked it. So I set out and searched for a A8 4.2 quattro, preferably in black. I ended up with a ’99 model in the color Mingblau – which is a really, really dark blue that almost looks black and only looks blue in direct sunlight. It is really hard to photograph, hence the car looks mostly black in the photos. When I bought the car, it came on 17″ wheels which are obviously way too small for such a big body car. I quickly ended up sourcing a set of 9×19 ET33 Audi Speedline wheels. Luckily, the car was already lowered on some Lowtec springs, so it even looks somewhat decent. Although, it is by no means low enough for me. However due to the challenges that such a big car brings with it in terms of driving low, I have made the decision to eventually go the airride route – that will probably happen after the winter. As it is, the car makes for an incredible daily driver – especially after I’ve had it converted to run on LPG fuel which really cuts down on costs. I even managed to sneak it into a few shows already, heh. Here it is sitting at Eurosunday in Belgium. I even managed to sneak it onto Players Classic at the Goodwood Circuit in the UK! That was an incredible trip and you can expect coverage soon. I have quite some plans for this car, but all in due time. As soon as things happen, I will keep you readers updated!